Remember when December was cold and the ground was covered with that fluffy white stuff? I grew up in the colder climate of Wisconsin and when I was two feet tall, so was the snow! I can’t help but feel nostalgic for snow, especially during the holiday season. Brown grass just doesn’t scream Christmas to me. South Texas and Atlanta friends bragging about their recent snow is salt in our dry wound. Remember the heyday of December 2006? It was epic! Twenty-one inches closed the airport only a few days before Christmas. When it reopened, both security lines wrapped around the entire airport amidst hundreds of abandoned suitcases. And Christmas Eve of 1982? Twenty-four inches! 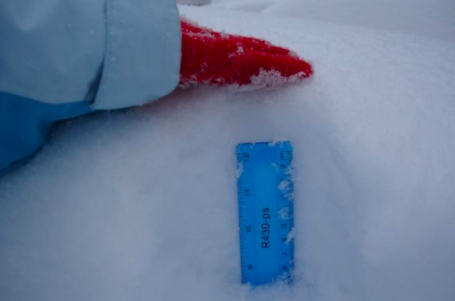 “We’re going to need a longer ruler.” December, 2006 snowstorm. All photos from the author. According to the National Weather Service, historically, there’s a 38% chance any Christmas Day would be white in Denver, with a much lower 15% chance of snow falling from the sky on that day according to the climatology. Climate records are broken left and right these days. With the latest La Nina pattern in the Pacific and one of the warmest years on record, every day is Mother Nature’s latest science experiment. We’re coming off of our warmest November on record and our weather pattern has been stuck on boring, although given what California has experienced from this ridge pattern, we know things can be worse than boring. The mountain snow pack is low and our last snowfall in Denver was October 10th. If we go until Tuesday, December 19th without measurable snowfall, Denver sets the all time record for a snow-free streak. We’d be taking the record away from the early 2000s, specifically, the streak from Thanksgiving-time 2002 through Groundhog’s day 2003. Remember what happened weeks after that streak ended? Denver got the 32” spring break storm that shut down the Front Range. The forecast has looked pretty bleak and boring for a while now, but there are two glimmers of hope for snow in the future. Sometimes a gal has to go against her years of meteorological training and make what we call a wishcast. This is when we look at the weather model forecasts more than five days out and take it as gospel. There’s a chance of snow this weekend, which would keep us from breaking the no-snow record. Also, in super-wishcast territory in the too-far-out-to-trust forecast is a nice Christmas Eve storm that could just make our fluffy dreams come true for the big day. It certainly would be no 2006 or 1982 storm, but if my wishcast comes to fruition, just about the whole country would be covered in sub-freezing temperatures with fresh snow in many places, including much of Colorado! Hey, a weather girl can dream of a white Christmas, can’t she? Keah Schuenemann, Ph.D., is an Associate Professor of Meteorology at the Metropolitan State University of Denver where she teaches meteorology and climate change courses.